Every year that I get older, I'm a little more leery of the fact that I'm not quite as tuned in to new records as I used to be. I try hard to keep up with everything, and I think as evident from this website, I do a pretty decent job and certainly buy my fair share of records. 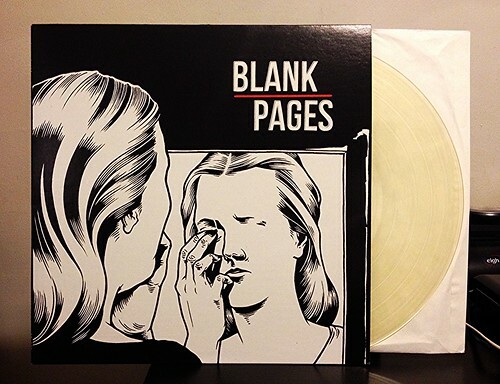 That being said, last year I blew it with the new Blank Pages record. Hardware records in Germany put this album for sale with different artwork and a limited to 100 colored vinyl variant. I completely missed it. By the time I had figured out that it had even come out, Dirtcult had announced their version. Even though there's something to be said about owning the limited, first press, colored vinyl, German import; there's also something to be said with being able to pick this up for 11 bucks with domestic shipping. Obviously I went that route. Sure, I'll probably want to find the other version at some point, but only because Blank Pages are just so damn great. Rising from the remains of the equally incredible Idle Hands; Blank Pages pretty much pick off where that band had left off. Wipers/Red Dons style, downstroke heavy, dark but fast & catchy punk rock. They're one of the current masters of the genre. If The Estranged were writing songs with bigger hooks, you'd be closer to the sound of Blank Pages. It's absolutely an essential album to pick up, especially since Dirtcult made it so easy to get in America. Do you have any idea how much I spent on those German Idle Hands records? A lot, that's for sure. The only problem I have now is not knowing if I can include this record on a top 10 list of 2014. It's certainly amazing enough to be a no brainer, but the fact that it came out last year in Germany first makes me unsure if it counts. Thoughts?